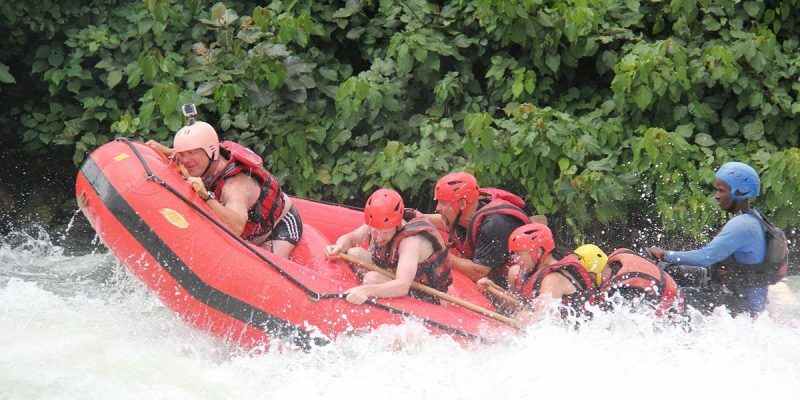 Adrenaline Activities on the Nile. Pick up from your place of residence as early as 8:00 A.M, and travel to Jinja, our first stop over is the Sezibwa falls. Sezibwa Falls is a 45 minutes drive from Kampala and is located on Jinja Road after Mukono town. It is a wonderful place for a nature walk, birding, picnics, a limited hike to the top of the falls and the cultural worship grounds with their lush greenery grounds which are suitable for camping with sound of the falls in the background. After Sezibwa falls we proceed to the Mabira forest walk, which starts from form the Mabira rain forest lodge. During this walk one gets to view and appreciate the lush greenery growing luxuriantly and hear the most authentic bird songs and sounds as they chatter in the top and canopies of this rain forest and if fortunate one get to see the elusive monkeys. Proceed with After the nature walk in the Mabira forest we pass via the Owen Falls Dam and then proceed to Jinja town for lunch. Pick you up from your hotel and hit the road for Jinja City. Proceed with After the nature walk in the Mabira forest we pass via the Owen Falls Dam and then proceed to Jinja town for lunch. Apart from the delicious meals, Jinja town possesses one of the best views of the source of the Nile and the railway. After lunch, take a short tour around Jinja town, we start from the Jinja railway stations and see the railway line that connects Uganda to Kenya and view the diesel locomotives. We proceed to the Hindu temple which has a bronze statue of Gandhi and visit the golf course which possesses very beautiful view of the Nile and Lake Victoria. To end the day, go for a boat ride to visit the actual point where the source of River Nile starts from and view the Speke monument where John Speke stood when he discover the source of the longest river in the world. Also get to see a number of water birds in the isolated tiny islands on the lake and then board the car and drive back to Kampala or your hotel residence. After breakfast and briefing, start your urban circuit which will include; Uganda Safari Makerere University, Bahaii temple the one of its kind in the whole of Africa, drive to Namugongo Martyrs shrine, Uganda museum, National theater or buganda road for the art and crafts, cruise around the city itself get to know places like Hotels, Post office and even bars and restaurants round the city.